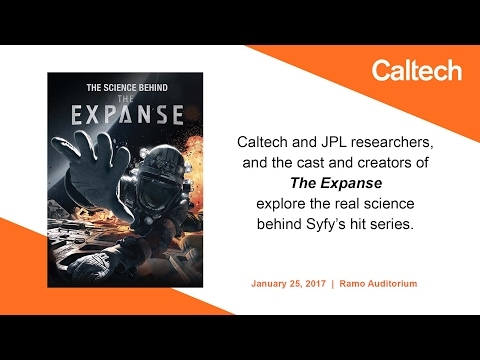 On January 25, 2017, Caltech and JPL scientists, and the cast, crew, and producers of the popular Syfy series The Expanse teamed up at Caltech for a panel discussion of the science behind the show and the importance of getting everything right, from the appearance of planets to the effects of extreme gravity on humans. The Expanse, which premiered in 2015, is set in our solar system 200 years in the future. Mars is colonized, and the human inhabitants of the asteroid belt between Mars and Jupiter—the so-called Belters—mine asteroids like Ceres and Eros for water and scarce resources. Earth, Mars, and the Belt are on the brink of war. The panel discussed topics ranging from politics to terraforming Mars to space travel and the nature of a mysterious goo injected into space travelers on the show. As shown in this clip of the panel discussion, Naren Shankar, executive producer and showrunner of The Expanse, who also has worked on the Star Trek TV shows, explained that the show's depiction of planetary bodies, such as the asteroid Eros, are based on real NASA images. The show's portrayal of low-gravity conditions in space was also discussed. Panelist Jessie Christiansen, a staff scientist at the NASA Exoplanet Science Institute at Caltech, broke down the science behind a scene in which two of the main characters nearly float off into space. Actor Cas Anvar, who plays pilot Alex Kamal on the show, talked about what it's like to drive a fictional spaceship under intense gravity, and engineer Bobak Ferdowsi from the Caltech-managed Jet Propulsion Laboratory compared the experience to driving a rover on Mars. The event highlighted the intersection of art and science, and how one can inform the other. Many of the panelists discussed how science fiction had inspired them in their own careers, and how they hope that the medium will serve as an inspiration for generations of scientists and actors to come. "I think it's an important opportunity to bring the people who make shows like this together with scientists who are actually pushing the frontiers of knowledge," said Robert Hurt, who moderated the panel and serves as an astronomer and visualization scientist at IPAC, a science and data center for astronomy at Caltech. "It's hard to underestimate the impact the creative team behind a show can have by portraying science effectively in their narratives. So many current scientists today were in part inspired into their current careers by the shows they watched in their youth." On the panel, Anvar talked about being inspired by the drive of Caltech scientists and engineers. "This room and this school is composed of people of all different walks of life, all races and cultures, and everyone here is so focused on just a singular vision of bettering humanity and reaching out further and discovering," he said. "And that's a very unique emotional experience to go through, to just feel this energy that's in this room, which has nothing to do with nationality or nationalism or any kind of selfish goal. It's exploration, it's discovery, it's furthering humanity. And that's something that this show really pushes the boundary of." And what about the enigmatic goo used in the show during high-speed space travel? According to Ty Franck, a writer on series and co-writer of the best-selling books upon which it is based, the substance is "future juice," used to protect people's blood vessels from shattering under extreme gravitational forces. Additional panelists from The Expanse were cast members Shohreh Aghdashloo and Wes Chatham. Caltech faculty members Bethany Ehlmann, an assistant professor of planetary science, and Philip Hopkins, an associate professor of theoretical astrophysics and Sloan Foundation Fellow, were also on the panel. Season 2 of The Expanse began on February 1, 2017. Watch the full Caltech event here. Ty Franck, Jessie Christiansen, Naren Shankar, Shohreh Aghdashloo, Bobak Ferdowsi, Cas Anvar, Bethany Ehlmann, Wes Chatham and Phil Hopkins at The Expanse panel at Caltech. Credit: Caltech Naren Shankar, Shohreh Aghdashloo, Bobak Ferdowsi, Cas Anvar and Bethany Ehlmann at The Expanse panel at Caltech. Credit: Caltech Watch the full event. Caltech and JPL researchers, and the cast and creators of The Expanse explore the real science behind Syfy's hit series. Ty Franck, Jessie Christiansen, Naren Shankar, Shohreh Aghdashloo, Bobak Ferdowsi, Cas Anvar, Bethany Ehlmann, Wes Chatham and Phil Hopkins at The Expanse panel at Caltech. Naren Shankar, Shohreh Aghdashloo, Bobak Ferdowsi, Cas Anvar and Bethany Ehlmann at The Expanse panel at Caltech.